How to make spaghetti squash? These low-carb "noodles" deliver a surprise punch of protein. 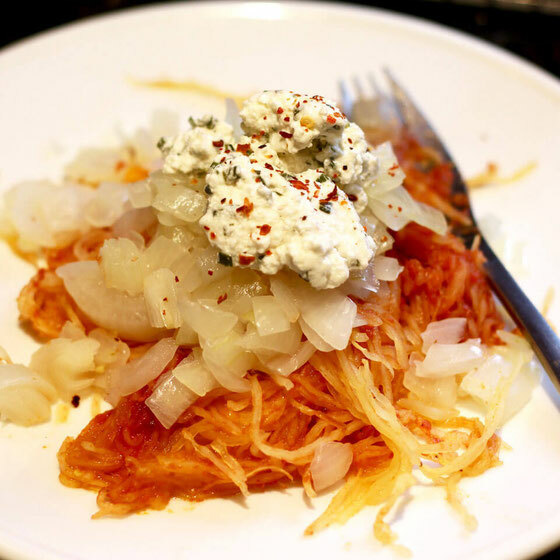 Enjoy this yummy spaghetti squash recipe for lunch or dinner. You know those nights when your fridge supply is lacking and you have to get creative with dinner? I had one recently. I knew I was going to make something with spaghetti squash and marinara sauce. But didn't have any other protein to add to dinner. Until...I eyed the cottage cheese in the back of the fridge. I put on my creativity hat and blended a delicious high-protein creamy topper for the spaghetti squash. I combined cottage cheese with olive oil, lemon juice, and fresh herbs. 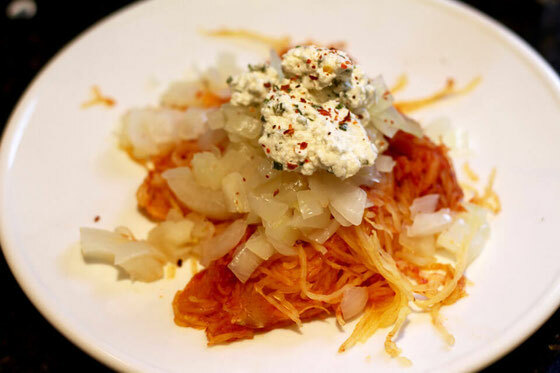 This spaghetti squash recipe, with a creamy cottage cheese topping, provides 8 grams protein per serving, which nets 16 percent of the daily value! 'll admit that I ate a double portion of this for dinner. But you can also serve with a few ounces of grilled salmon or chicken breast for a complete meal. I'm really craving this dish right now! Preheat oven to 375°. Meanwhile, use a fork to poke several holes in the spaghetti squash. Then microwave until the squash becomes slightly tender, about 4 to 6 minutes. Slice squash in half, and remove seeds and membranes. Place halves with cut side up on a nonstick baking tray, and brush the tops with 1/2 teaspoon olive oil. Place halves with cut sides up, and roast until fork tender, about 40 to 50 minutes. Meanwhile, place onions in a medium pan, and add a small amount of water, so that onions are just covered. Cook over medium high heat until onions become translucent and most of liquid is dissolved. 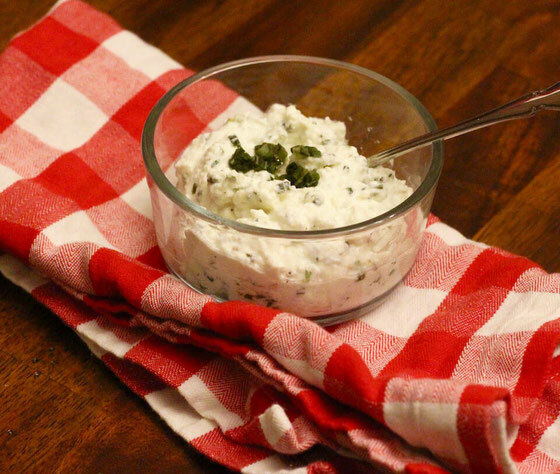 Puree in blender cottage cheese, remaining olive oil, chives, oregano, and lemon juice. Set aside. Once squash is cooked, remove from the oven and set aside to cool. Use a fork to shred the squash into a large bowl. Toss with marinara. Divide onto four plates, then top with onions and cottage cheese mixture. Sprinkle with red pepper flakes and black pepper. Serves 4. What are your thoughts on this topic? What are your favorite ways to prepare spaghetti squash?